By Phil Cave with photo courtesy of Limosales.us. August of 2011 marked the end of production of Ford’s Lincoln Town Car, a fact bemoaned by most limousine operators. The Lincoln Town Car had basically taken over the Livery based limousine market (but not the Funeral Market) for many good reasons. The Ford Motor Company and General Motors each work closely with the Livery and Funeral industry. These manufacturers produce “shells” or “program cars” that only specially qualified Coach Builders can purchase. These Builders have to go to Ford or GM or both to get qualified under their programs; Ford’s program is called the Quality Vehicle Manufacturer (QVM) program, and GM calls its, the Certified Master Coachbuilder (CMC) program. Ford and GM have done all the engineering for stretch vehicles and they have set all the guidelines Coachbuilders must follow to be qualified under their warranty programs. Only QVM and CMC built vehicles can be exported to Canada. Ford warranties QVM and CMC built cars for 4 years or 150,000 miles and GM warranty its program vehicles for 3 years or 150,000 miles… these warranties are transferrable for livery/funeral operators. Notice that Chrysler is not included, Chrysler up until now has not been interested in participating in this program with the Livery or Funeral industry. Also note that not all Ford/GM vehicles are certifiable under the warranty program. For example H2s, Escalades and other vehicles are not included. Any stretch over 140” do not qualify under these programs. Program cars are built on the same chassis as their related consumer cars, but both Ford & GM reinforce these chassis, they add what is sometimes referred to as the limo package, which includes beefed up suspension, alternator, oil cooling systems, braking system and other changes designed to improve the performance and the durability of these coaches. These program cars have all the electrical set up so all the limousine builder has to do is cut the Shell, extend the body and run the electrical through a board and then to the rear of the vehicle, and finish off the interior. Cadillac lost its dominant position in the Livery Industry to Lincoln in the early 1990s. The majority of operators found that they liked the rear wheel drive Lincoln’s better than the front wheel drive Cadillac’s. Cadillac remained (and remains) dominant in the Funeral Industry primarily due to lack of mileage generally put on Funeral coaches. The front wheel drive Cadillac arguably looks better than the Lincoln, but when it comes to operation, Lincoln lasts. Cadillac require more care and attention, they have very regular issues such as motor mount failure, and valve cover gasket failures. While you can easily find Lincoln Limos with 300,000 to 400,000 miles in good condition, at these mileages most Caddys are in the scrap yard. GM parts also cost more than the same Ford equal parts. The collapse of GM, the near collapse of Ford, increasingly stiff federal fleet mileage requirements, and dwindling sales forced both Ford and GM to rethink their luxury car line up. The Lincoln Town Car and Cadillac’s DTS are no longer being produced. The new Lincoln Limousine is based on the MKT frame and utilizes a V6 motor. Cadillac’s indicates that its DTS replacement the XTS (same frame as Lacrosse) due out sometime latter this year will also have a V6 motor. Ford and GM need to compete worldwide in the luxury car market where their main competitors are Mercedes, BMW and maybe Lexus. Lincoln’s MKT is a crossover vehicle, an SUV that drives like a car. Cadillac’s XTS resembles the CTS, which is selling well both here and abroad. The Limousine/Funeral industry represent only a very small fraction of these manufactures sales. Their presence in the Livery/Funeral industry market is (apparently) both traditional and due to the prestige and high visibility associated with vehicles in these industries. Basically, the Livery and the Funeral industry has to take whatever Lincoln and Cadillac has to give them. The new Lincoln MKT Limousine was just shown at LCT’s (picture to left above) Vegas Limousine Convention. This coach is shorter and narrower than the Town Car, it has the V6 motor versus the Town Cars’ V8 and the MKT is a hatch back. A friend of mine drove one of the new models to the Convention, he indicated he was surprised by how well it drives, he indicated that it has plenty of power, head room, but not as much leg room and luggage capacity as the Town Car. Many individuals do not like the split waterfall grill, sort of like a Cheshire cat with a middle tooth gap-look about it. 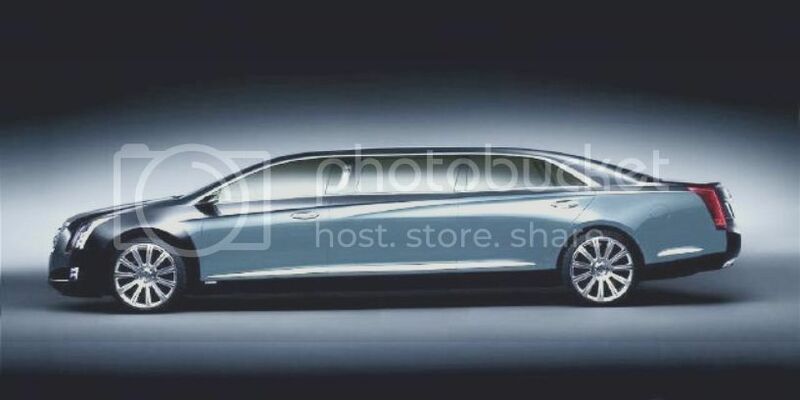 Cadillac has not, to best of my knowledge, finalized its XTS car, although there are some purported views online. Cadillac has indicated that the maximum GMC stretch for this vehicle is 80”! Cadillac has basically told the Livery Industry that it’s is trying to retain its dominant position in the Funeral Industry. Unlike the fat cat look of the Lincoln, the Caddy looks very sharp, stylistically way ahead of Lincoln. It remains to seen how this will translate into a stretch limousine since the XTS is smaller than the DTS. Caddy is reported to want to bring out a rear wheel version of the XTS with a bigger motor in 2015. Meanwhile, the new Lincoln Hearse on the MKT chassis is a hit in the funeral industry. The only problem is that there are not enough chassis available to fill the orders and many dealerships are indicating long waiting periods. It remains to be seen how these cars will play out in the marketplace. Ford/Lincoln has a new concept grill for the MKZ, which may be the same grill to end up on the MKT. This design is interesting; Lincoln keeps straight lines and then bends the nose and grill to give the car some curvy, European lines. Poster's comment; I saw this handwriting on the wall when the Lincoln and Cadillac sedan heavy duty rear wheel drive chassis were withdrawn - Mercedes Benz here we come!